Our annual fundraising weekend, Manhattan at the Bay, is around the around the corner and we are looking for parent volunteers to bring in baked goods for the Cabaret Cafe, a place to mingle and purchase coffee and desserts during and after Friday night's Stardust Melodies | Cabaret 36 performance. Cabaret Cafe will be open Friday, April 25th from 6:00 PM to 9:00 PM in the Walsh dining room. If interested, please sign up using the link below. Our annual fundraiser Manhattan at the Bay is around the corner and we're proud to announce two of our most popular events are back for another year! Join us Friday night before the 6:30 PM show for the "Little Italy" family dinner sponsored by Little Tony's Pizza and Pasta restaurant. The event runs from 4:30-6:00 PM. Tickets are $10 each. Then, on Saturday night, after the final Cabaret performance, kick off your shoes, and brush up on your Broadway musical favorites for Cabaret & Cocktails - The After Party. Hor d'oeuvres, special guest performances by Bay View Players alumnae, and DJ dance party will make this a celebration you cannot miss! The party begins at 8:00 PM (following the 6:30 PM show). All tickets are $20 + cash bar. Tickets for all events including Stardust Melodies | Cabaret 36, are available for purchase at ticketor.com/bayviewboxoffice. We're happy to announce our second quarter Honor Roll! Please join us in congratulating all of our students on a fantastic finish to the second quarter! To see the full list of students, click the link below. Join the Bay View Players from April 25-27th, and be dazzled as our talented students and performing arts department bring the brilliance of the Broadway stage to Bay View with a cabaret-style production titled Stardust Melodies. This time-honored tradition and celebration of performing arts is one you cannot miss! Tickets are now on sale and are selling fast, don't miss out on getting a great seat and supporting a great cause! Showtimes: Thursday, April 25, 2019, at 6:30 PM Friday, April 26, 2019, at 6:30 PM Saturday, April 27, 2019, at 2:00 PM Saturday, April 27, 2019, at 6:30 PM Tickets purchased in advance: $15/pp Tickets purchased at the door: $20/pp All are welcome to attend, and 100% of the proceeds from the weekend go back to supporting all of the girls of the Academy. Interested in becoming a sponsor? Visit our sponsorship page at http://bit.ly/MATBSponsorship. Join us April 25-27th, 2019 for our annual fundraiser Manhattan at the Bay! 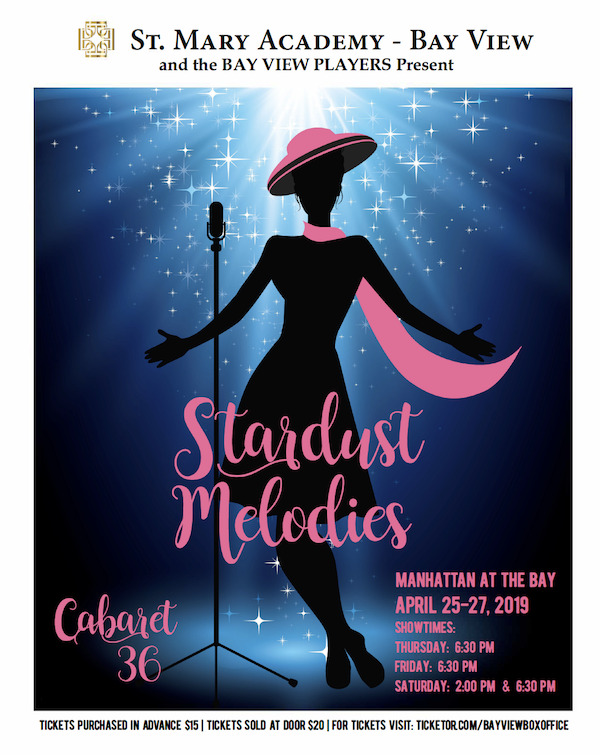 This year Manhattan at the Bay is celebrating its 36th year, and the Bay View Players will present an original cabaret-style production titled, Stardust Melodies, as the centerpiece of our annual fundraising weekend. Stardust Melodies brings the brilliance of the Broadway stage to Bay View. In addition to spectacular cabaret-style performances, other Manhattan at the Bay events include Friday's “Little Italy” Family Dinner, and the Saturday night Post Show Soirée. All are welcome to attend, and 100% of the proceeds from the weekend go back to supporting all of the girls of the Academy. Online tickets go on sale February 1st. Get early access to tickets by becoming a sponsor at http://bit.ly/MATBSponsorship. First Quarter Honor Roll Announced! The St. Mary Academy - Bay View community recognizes those students who demonstrate above average scholastic achievement on a quarterly basis via the Honor Roll. A student in grade six through twelve who achieves all A's for the quarter grading period is given "highest honor." A student who achieves A's and B's for the quarter grading period is recognized with "honor." Below, is a link to our Honor Roll list for the 1st quarter of the 2018-2019 academic year.